8 ½ Otto e Mezzo is the current talk of the town in the Hong Kong fine dining scene. Having just received its third Michelin star (apparently the only three star Italian restaurant outside Italy), it is probably one of the hardest places in the city to get a reservation right now. Opened by the highly regarded chef Umberto Bombana, formerly of Toscana Ritz Carlton in Hong Kong (never eaten there before unfortunately), it is located in Alexandra House in Central amidst the office blocks occupied by investment banks, hedge funds, law firms and accounting firms (which explains the clientele the night we had dinner there). The restaurant has both a bar area and a formal dining space. The bar takes seatings for meals and, though the tables are smaller, are comfortable enough at which to have a proper dinner. Despite having made the reservation 2 weeks in advance, we were only able to secure table at the bar area for a Monday night dinner. However, we lucked out as on the day itself, Hong Kong issued a Typhoon 8 warning earlier in the evening which led to shops and offices being closed early. This must have caused some guests to cancel their reservations and we were instead given a large booth table at the main dining room. We were impressed with the interior of the main dining room. With the clever use of partitions, mirrors and large windows, it gave the impression of being spacious yet discreet. Service was professional though not genuinely warm and the wine list had a good selection of Italian favourites. We selected a 2007 Guado al Tasso which we really enjoyed. Our dining experience was slightly marred by the rather scary howling winds from the typhoon on one side (we could see out of the windows the trees, lamp posts and other fixtures on the street violently shaking) and a table with a group of noisy and drunk young professionals on the other side. 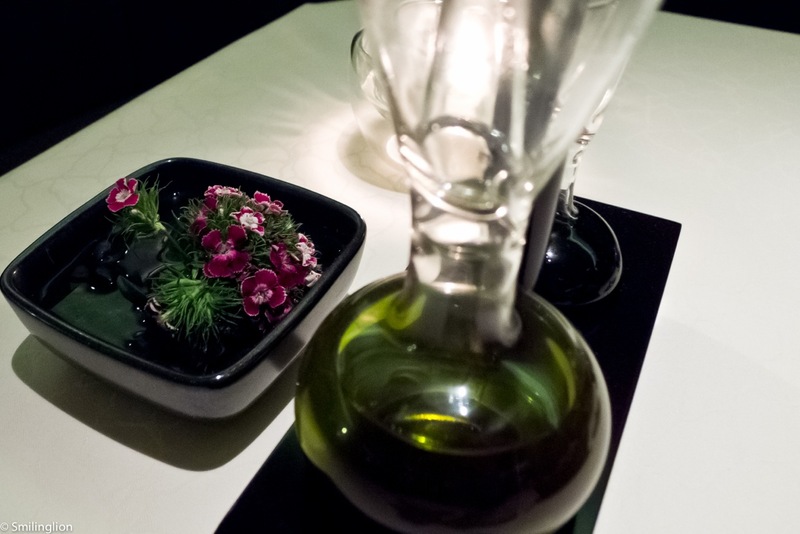 Strangely, we were served our amuse bouche immediately when we took our seats and even before we had placed our food or wine orders. 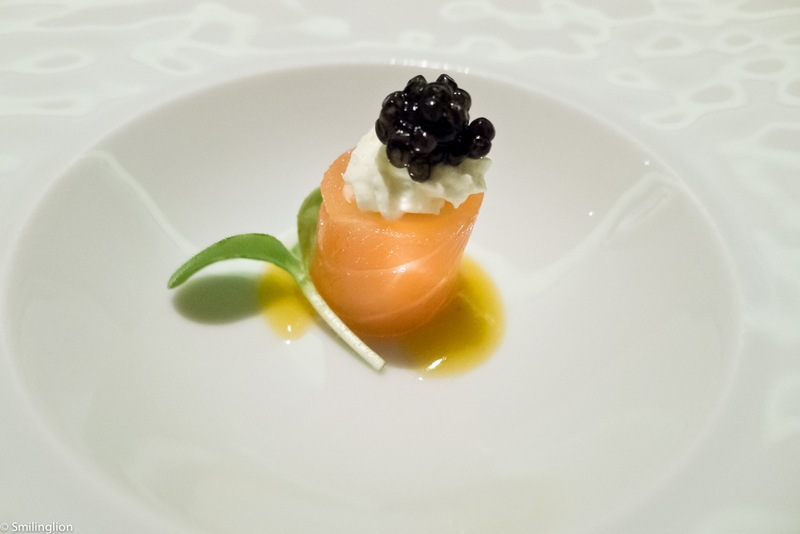 The amuse bouche was a raw salmon sashimi with caviar. It was simple but quite nice. 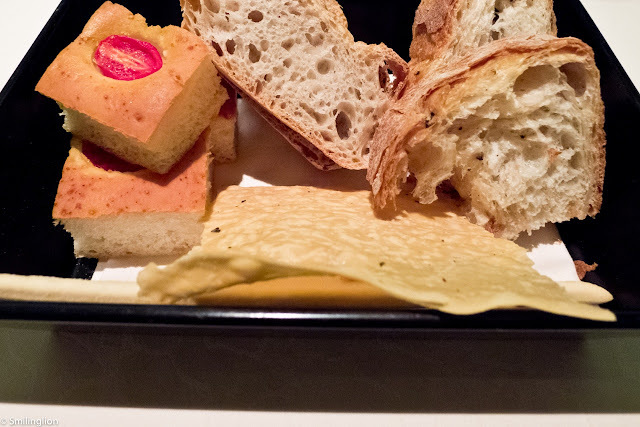 The bread basket wasn't great (not surprising for an Italian restaurant) but I gorged on the amazing breadsticks. 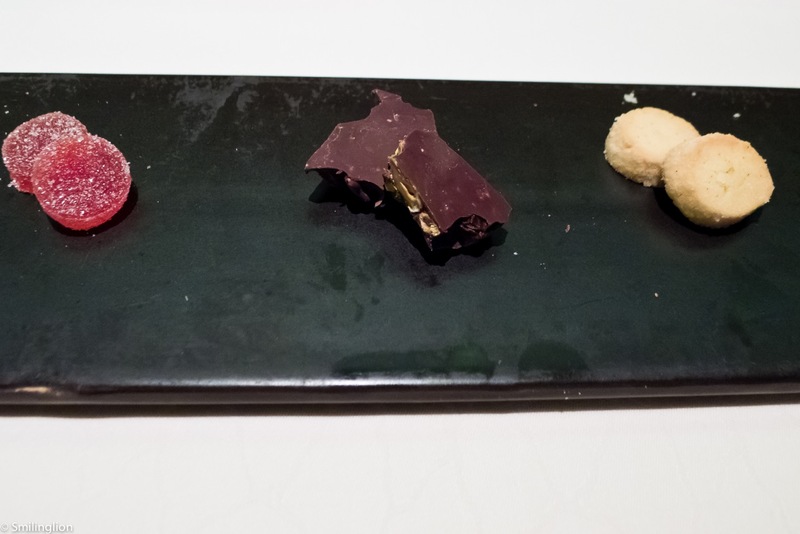 Forsaking the tasting menu, we ordered one starter each, one pasta each and shared the main course and dessert (which were both portions for 2 in any case), with the recommendation of our waiter. 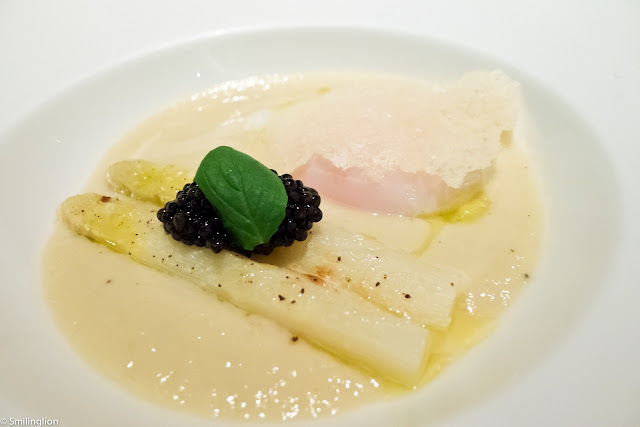 Sarthe White Asparagus - confit of organic egg, calvicius caviar: Uncomplicated and elegantly executed but this was a dish to be appreciated by one who loves white asparagus. Unfortunately my wife wasn't one of them and hence she couldn't really enjoy this as much as she should've. However, she enjoys caviar but she didn't think this to be the best caviar available. 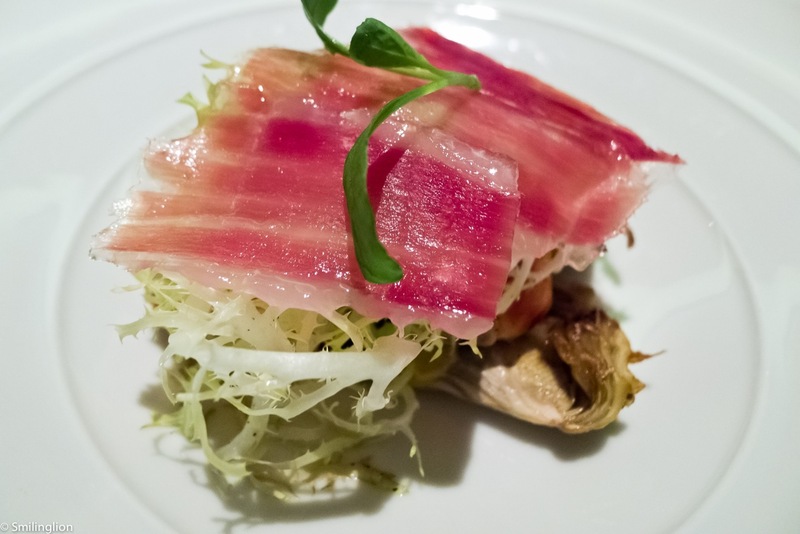 Warm Lobster Salad - on roast ligurian artichoke, savored with Cinta Senese ham: I thought my starter was fantastic. The smokiness of the artichoke was well paired with the sweetness of the lobster and the savoury ham. The ingredients for this dish were thoughtfully put together and their freshness was accentuated. 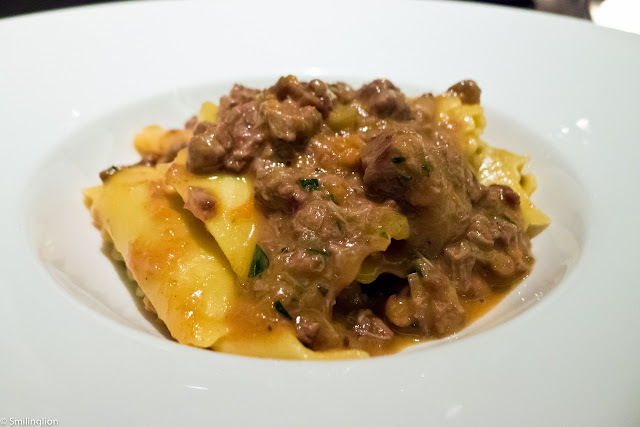 Pappardelle - lamb and mushroom ragout, fresh rosemary: The freshly-made pastas here were superb and the parpardelle in this case was cooked al dente with a rich and delicious ragout sauce. This was a standout pasta dish. Freshly-made Tagliatelle with Australian Black Truffles: Off the menu, the black truffle tagliatelle was highly recommended by the waiter and it did not disappoint. Not the biggest fan of black truffles (I've been spoilt rotten by the white varietal), the pasta in this case was prepared perfectly to complement the copious amounts of black truffle shaved on my plate (to make up for the relative blandness of black truffles generally, I'm sure). It was very eggy in its construction, was barely cooked and then tossed lightly with some olive oil (and a bit of butter perhaps? 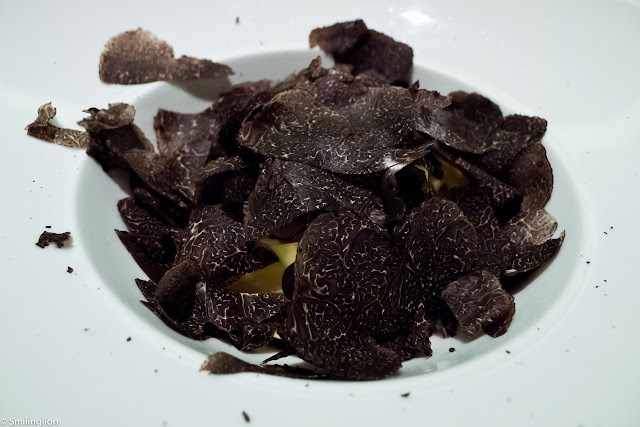 ), so much so as to allow to two main flavours to be take centre stage: the egg (in the tagliatelle itself) and the black truffles. Chef Bombana is acclaimed as the 'King of Truffles' and from this dish it is not hard to see why. Veal Chop - crispy "Milanese" style, sicilian tomato and oregano salad: Another dish highly recommended (by the waiter as well as our friends who have been here) was the veal milanese which was served in a size suitable for 2 persons or up to 4 persons. Even the smaller portion for 2 persons was rather substantial. 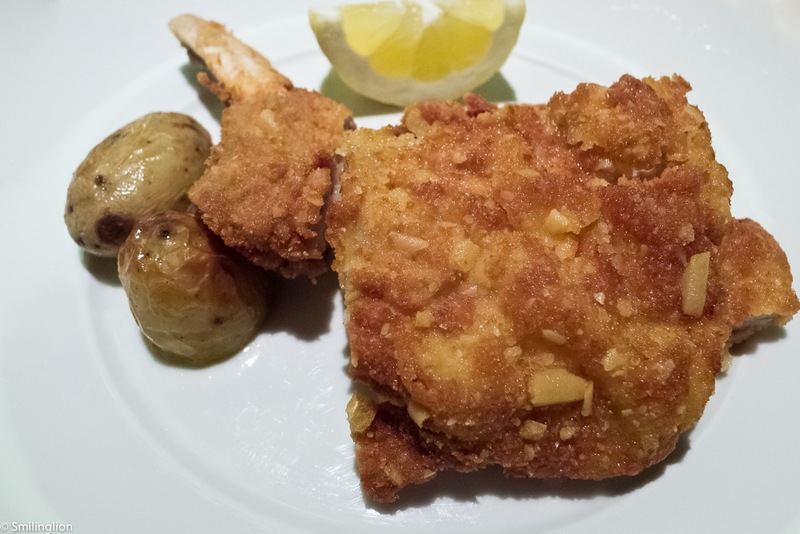 This was probably the best veal milanese we have ever tasted (though we have not had the chance to eat this dish in Italy). 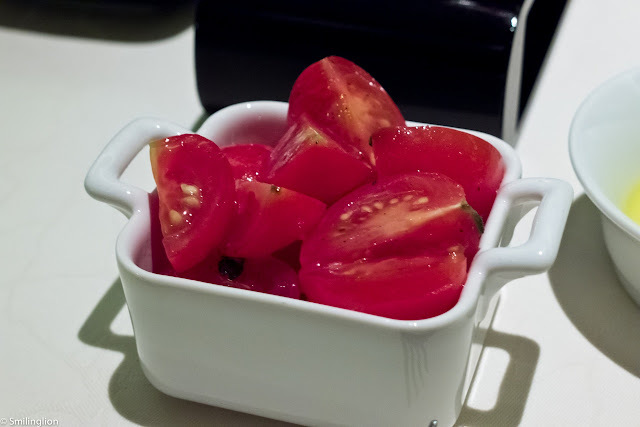 The accompanying cherry tomatoes were sweet and fresh. 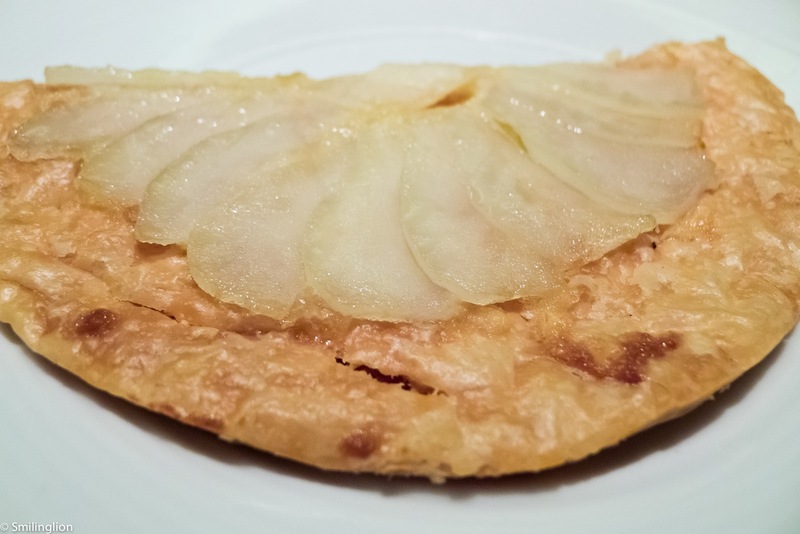 Crispy Pear Tart - served with vanilla ice cream: The dessert was a portion large enough for 2 and was a very thin and crispy millefeuille tart with pear slices on it. 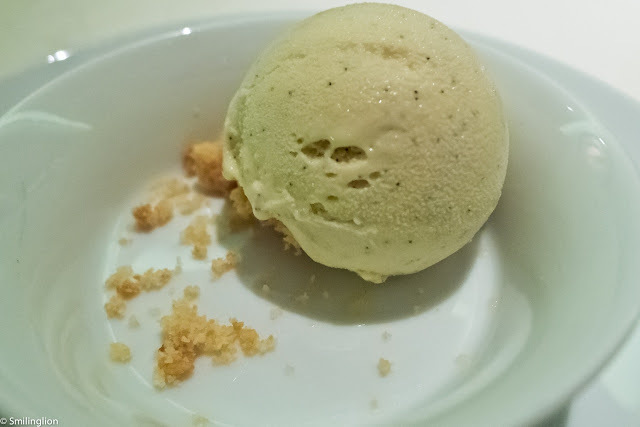 The vanilla ice cream was also amazing. This was a very good dessert and was brilliant in its simplicity. Dinner was rounded off with some coffee/tea and petit fours. Final Thoughts: This was a very good restaurant which emphasised the execution rather than the reinterpretation of traditional Italian dishes. The result of that was a selection of dishes which could otherwise be served in other Italian restaurants but cooked flawlessly in this case. 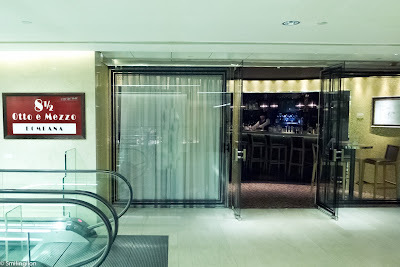 Philosophically (food-wise) we would compare this to another 3 Michelin star Italian restaurant, Al Sorriso in Italy (although we feel that Otto e Mezzo is not yet quite at the standards of Al Sorriso, based on our meals in both restaurants). As for its title as the only Italian restaurant outside Italy to have 3 Michelin stars, we would not comment other than to say that restaurants opened by other top Italian chefs outside Italy like Marea by Michael White may feel slightly shortchanged (not to mention the other Michelin starred restaurants in Italy).